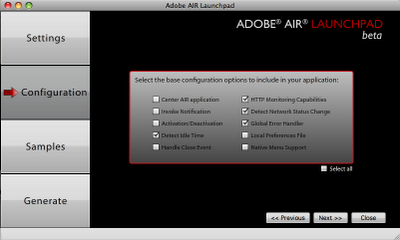 Flash Player 10.1 really a major release? 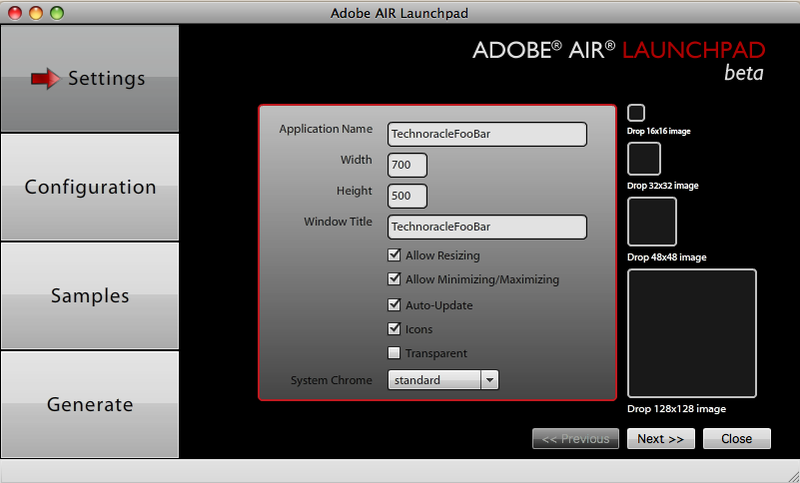 Having used Flash Player 10.1 for a while now, I am blown away by the number of very cool advances. Most of these are subtle yet some are of staggering implication. Recently, I came accross a video made by Neil Trevett from NVIDIA where he discusses GPU acceleration in Flash Player 10.1. The video showcases how Flash Player and NVIDIA offload work from the CPU to the GPU (NVIDIA’s ION chip). The results are very impressive, enabling Flash Player to provide HD video on a range of devices — even the smaller netbooks. Adobe AIR Launchpad - WOW!!! 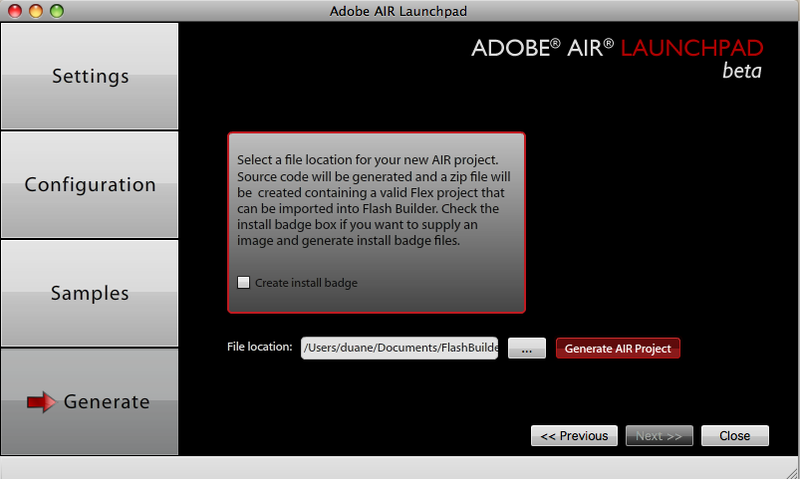 "Adobe AIR Launchpad is a new desktop tool that helps Adobe Flex® developers get started building desktop applications deployed on Adobe AIR. 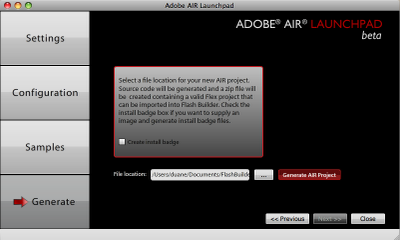 Simply run Adobe AIR Launchpad and select the capabilities you need; Adobe AIR Launchpad will create a ready-to-import Flex project with your selected features implemented in a way that can be easily modified and extended. You can use the resulting project as a starting point for your AIR application." From the next wizard menu you can select items like global error handling, detection of idle time or network capabilities etc. and finally, the ability to select some standard types of things many developers would use. I imported and opened up the resulting project and found all the generated code and assets neatly placed into the same directory structure I would have used. Very cool! I did have one small red X in the project which was thrown as the compiler did not recognize "e:UncaughtErrorEvent". Duane. You must read this great novel about a Spanish guy named 'Manual'. From Technoracle, Adobe AIR Launchpad scores a solid 9/10 for the first release, largely due to the fact it saves lazy developers like me a lot of work! Well, I am not really fully back at work but since I have a computer in front of me, figured I'd get a little work done. Every week (barring the hospital stay) I have been promoting a different MAX 2010 Livecycle ES session. This week, the session I will promote is one I am co-leading with Scott MacDonald. If you do not know who Scott is, he is the guy who writes most of the Livecycle ES Quickstarts and has a full depth of knowledge when it comes to LC ES. If you've ever needed to integrate LC ES with CMS or invoke an API remotely, you need to meet Scott! This session is for anyone who has worked with Livecycle ES and found a need to extend it. It can be quite daunting your first time and that is why we have put this session together. Building and deploying a custom component and integrating Livecycle ES with other J2EE environment applications should not be feared. Once you have the know how, it is actually very easy due largely to the great architecture and abundance of collateral to help you. This session will impart this knowledge to attendees and you'll walk away with more than your money's worth for a 90 minute session. Join product experts and others as we work through the process of creating a Plain Old Java Object (POJO) that will be packaged and deployed to the Adobe LiveCycle Enterprise Suite service container as a custom component. 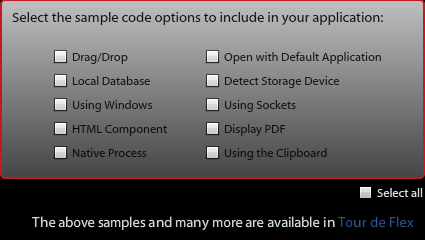 Once your component has been deployed and activated, you'll then explore several invocation methods (SOAP, REST, and Remoting) to call your newly available service. Hey everyone. I am so humbled by the thousands of comments, messages, emails, SMS's etc. I have received. I am truly the luckiest person alive to have so many great friends and it made a huge difference when I was sitting in the hospital room alone. You’re all correct – I’m gonna kick this sickness in the arse so hard it won’t come within a 1,000 KM of Vancouver. Cannot believe I was even thinking of letting this thing make me a victim. So I got the renal biopsy done on Thursday and the first results were in Friday AM. The unbelievable is happening - > my own kidney’s seem to be starting to heal themselves (prognosis was less than 5% this would happen). The Creatinine score fell from over 350 to 314 with no treatment. It’s too early to tell if this is a real trend or not but I’m gonna ride this wave as if it is. There is still a long road ahead to full recovery but the best thing happened. I got discharged from the hospital after two weeks and am now getting treated as an outpatient. This means I get to be at home to recover. I still have to have daily blood tests and monitoring done so it will be a while before I am back to full speed. I also set a short term goal to be able to play with 22nd Century on Sept 2nd at the Backstage Lounge for Jesus Krysler’s CD release party along with Blackburn X and Helmz Deep. Focusing on this show as a goalpost will help. I hope you'll join me there. Again – I really want to thank you all. Please accept apologies if it takes a while to individually thank you but know you made a huge difference.